A healing method that focuses on personal empowerment by identifying and clearing suppressed feelings and cellular memories in the human energy field. Painful, traumatic and difficult experiences can remain with us on a physical, emotional, mental or spiritual level long after the event, accident, death of a loved one has taken place. Each time we have experiences that impact us negatively they are stored on one of those levels (physical, emotional, mental or spiritual ) which creates an energy block. Like multiple transparencies placed on an overhead projector, these experiences begin to block out light or energy. This can lead to energy depletion, a sense that things are just not right, sadness or a feeling of unrest or agitation. You feel out of balance somehow and can “not feel like yourself”. Energy blockages can cause mental, emotional and spiritual disorders and perhaps diseases if not cleared. Integrated Energy Therapy is a deeply relaxing, non-invasive method for removing these blockages. Integrated Energy Therapy helps you release negative blockages permanently. Each session will reduce the layers of imprinted experiences like removing the layers of an onion. This will clear energy patterns and allow you to free yourself of limitations. You are then empowered to be who you were meant to be. IET was developed at the Center of Being, by Stevan J. Thayer. It brings healing to the next level, working with the energy of angels. 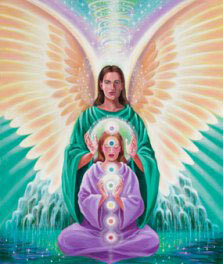 IET uses a divine angelic energy ray to work directly with your 12-Strand Spiritual DNA. IET supports you in safely and gently releasing limiting energy patterns of your past, empowering and balancing your life in the present, and helps you to reach for the stars as you evolve into your future. Helps you to discover and live your Soul's mission in life. Provides gentle yet powerful support for survivors of childhood traumas.